The multiple components that compose our universe. 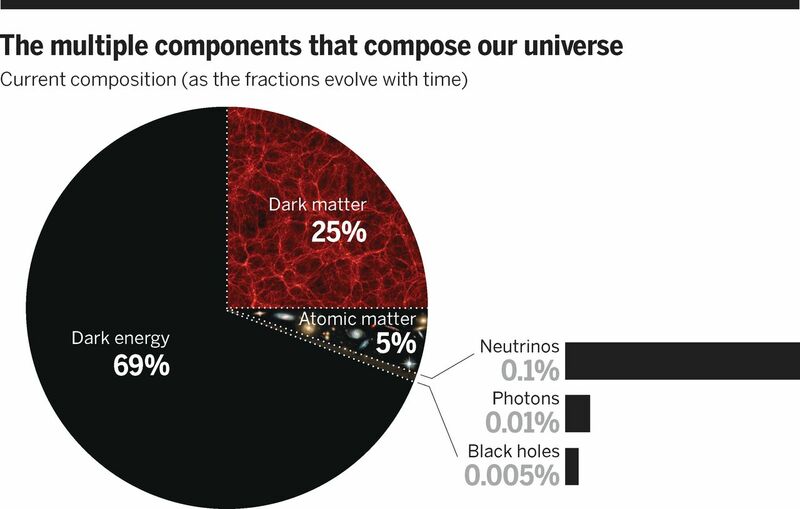 Dark energy comprises 69% of the mass energy density of the universe, dark matter comprises 25%, and “ordinary” atomic matter makes up 5%. There are other observable subdominant components: Three different types of neutrinos comprise at least 0.1%, the cosmic background radiation makes up 0.01%, and black holes comprise at least 0.005%. Sure, the Universe is expanding, and that expansion is accelerating. But beyond simply calling the cause “dark energy,” what do we know about it? [We] have found that dark energy makes up about 70% [of the] energy in the universe. We have evidence of dark energy from multiple observations. It has [a] real effect on the evolution of [the] observable universe. But what is dark energy? Do we have any idea? Do we have any good models for it? As it turns out, we do have some good ideas, but let’s make sure we’re all on the same page first…. Although statistical evidence is not overwhelming, possible support for an approximately 35 million year periodicity in the crater record on Earth could indicate a nonrandom underlying enhancement of meteorite impacts at regular intervals. 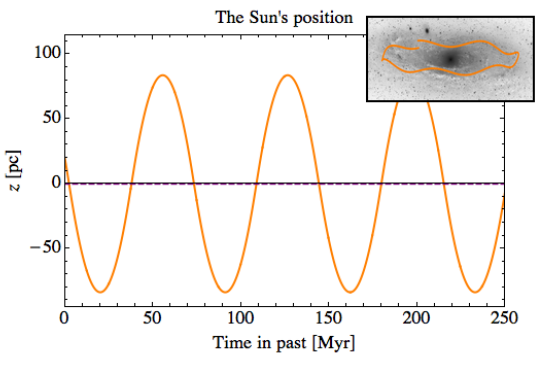 A proposed explanation in terms of tidal effects on Oort cloud comet perturbations as the Solar System passes through the galactic midplane is hampered by lack of an underlying cause for sufficiently enhanced gravitational effects over a sufficiently short time interval and by the time frame between such possible enhancements. We show that a smooth dark disk in the galactic midplane would address both these issues and create a periodic enhancement of the sort that has potentially been observed. Such a disk is motivated by a novel dark matter component with dissipative cooling that we considered in earlier work. We show how to evaluate the statistical evidence for periodicity by input of appropriate measured priors from the galactic model, justifying or ruling out periodic cratering with more confidence than by evaluating the data without an underlying model. We find that, marginalizing over astrophysical uncertainties, the likelihood ratio for such a model relative to one with a constant cratering rate is 3.0, which moderately favors the dark disk model. Our analysis furthermore yields a posterior distribution that, based on current crater data, singles out a dark matter disk surface density of approximately 10 solar masses per square parsec. The geological record thereby motivates a particular model of dark matter that will be probed in the near future ….